Spring has sprung, and so has your pup’s allergies. It started with little tilts of the head, then constant shaking, and now full-blown itching. Your pup scratches, and scratches, and scratches, and finds no relief. He might gnaw at his paws or rub his face against the carpet. He might be sneezy or even hacking a little from an itchy throat. The more your dog scratches, the more inflamed his skin becomes, causing the irritation to become tender and sometimes even leading to hair loss, open wounds, bleeding, and scabbing. When the weather starts to warm, there are precautionary measures you can take to ease your dog’s discomfort from seasonal allergies. Though you cannot stop the allergens rising from the newly-thawed earth, you can be proactive in the treatment of your home and the care of your dog. Though your dog may hate it, the vacuum is going to save him from allergy symptoms this season. Keeping your home vacuumed, especially the areas where your dog enjoys to lounge, minimizes the collection of the allergies you track inside. This way, when your dog lies down for his afternoon nap in front of the couch, he’s not lying in a cloud of allergens that have been festering for days. Using dog bath wipes frequently can dramatically reduces your pup’s allergy symptoms. When your dog comes in from playing outside, give him a quick rub down with a bath wipe to remove any pollen or allergens collected on his fur. Though not a substitute for a proper tubby, the bath wipes will remove excess surface allergens to prevent allergen buildup every time your dog goes outside. Bath wipes provide particular relief for your dog’s face, ears, and paws. Quick wipe-downs with bath wipes save your dog from sitting in allergens, exacerbating his symptoms. Your dog’s immunity plays a crucial role in combating allergies and allergy symptoms. Keep your dog’s health in tip-top shape. During allergy season, try to avoid scheduling any vaccinations or medications. Keep your pup’s immune system healthy and focused on only fighting allergies. 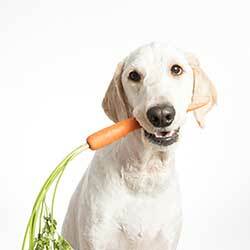 Keeping your dog’s diet in-check works in tandem with keeping his immune system healthy. When your dog eats well, he lives well. If your pup is especially vulnerable to seasonal allergies, try to avoid carb-rich foods by opting for food that is low-grain. Carbohydrates have been shown to worsen skin inflammation, which will cause greater irritation as your dog itches and scratches. Changing the filters in your air conditioning prevents the recirculation of allergens throughout your home. When your air filters are fresh, they’ll catch allergens and pollen from being spread throughout your home via your HVAC system. Omega-3’s (fish oil) is known to improve hair, fur, and coat health in both humans and dogs. The oils of omega 3 enrich hair and fur follicles, preventing skin and scalp from becoming dry. Omega-3’s can provide your pooch a little extra skin-boost to relive their sense of itching and irritation due to allergies. Hot spots are raw, red, irritated areas of the skin. When your dog itches and scratches, his skin becomes inflamed and irritated. As he scratches more and more because he feels no relief, his skin will become raw, sometimes bleeding or scabbing-over. The moment you notice hot spots on your dog, apply antibiotic ointments to ease the pain and prevent infection. Sulfodene treatments are recommended, as they are FDA-approved and 100% safe for your dog. Coconut oil, Pinterest’s miracle food, is excellent for your dog’s skin and coat when consumed in small portions with your dog’s food. Coconut oil’s lauric acid is great for buffing your pup’s immune system, as well as keeping their skin hydrated and their fur sleek. You can also apply coconut oil straight onto your dog, rubbing over dry and itchy areas. Especially helpful for dogs who carry their allergies in their feet, foot soaks provide instant relief to hot, itchy, irritated paws. Apple cider vinegar (or hydrogen peroxide) combined with warm water will instantly soothe your dog’s scratchy, sore paws. When it’s tubby-time, be sure to have medicated shampoo or hydrating shampoo on hand. Your dog will have instant relief as the warm bath water washes away the allergens clinging to his fur. Still, you want to make sure that the shampoo you are using doesn’t dry-out his skin. Lots of shampoo can actually remove the special oils from your dog’s coat, causing dry skin that will easily become irritated. Combining post-bath dry skin with your dog’s allergies is a big no-no. Make sure your dog’s shampoo is either medicated or specifically formulated to add moisture and hydration to your dog’s coat. You may also want to consider conditioner: then your pup will be itch-free while looking fabulous! Don’t let your dog suffer: it is absolutely acceptable to take your dog to the vet for allergies. Sometimes, it can be hard to gauge just how intense your dog’s allergies are. 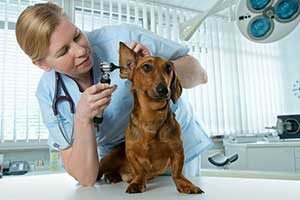 If your dog is struggling and finding no relief, a vet will be able to provide a better understanding of your dog’s particular allergies and offer medical solutions. Do not self-medicate your dog until your vet has given you the O.K. Your vet will be able to tell you the extent of your dog’s allergies and be able to directly treat their symptoms. It is incredibly important that you tend to your dog’s seasonal allergies. Even if their symptoms seem minimal, treat them. Environmental allergies are on the rise and every year that goes by they increase, meaning that next year (and the year after, and the year after) your dog’s symptoms will only worsen. Even more awful, since your pup’s allergies are derived from his immune system, his allergies will only worsen the more he is exposed to allergens. Which means, even without the increasing number of allergens in the environment, your pup’s allergies would still grow worse just by exposure. So be sure to take care of your pups. Give them a spa day, wipe them down, vacuum. They’re good dogs. Be good to them.